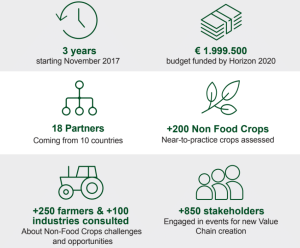 The Horizon 2020 PANACEA project aims to set up a thematic network to foster the effective exchange between research, industry and the farming community in order to design the penetration path of Non-food Crops (NFC) into European agriculture. Non-food Crops (NFC) are used to produce a wide range of bio-products and bioenergy. In spite of considerable investment in R&D and the increasing need of bio-based industries for feedstock, NFCs are not widespread in EU agriculture. This is mainly due to challenges in supply chains and gaps in policy framework and investment incentives. PANACEA project aims to set up a thematic network to foster the effective exchange between research, industry and the farming community. In this way, direct applicable solutions will be widely disseminated as well as grassroots-level needs and innovative ideas will thoroughly captured in order to design the penetration path of NFC into European agriculture. There are many objectives that PANACEA project is finalized at pursuing. One of these is to create an inventory of long-term scientific results generated through R&I projects on the sustainable production of NFC as well as to identify those that are close to implementation in agricultural and forestry practice. Another one is to analyse the role that NFC can play in the renaissance of European rural areas taking into consideration the farmers’ and bio-based industries’ needs and interests. To establish a strong and interactive multi-actor forum will be also fundamental, by involving a wide range of actors from science, industry and agricultural practice that will facilitate capturing and spreading innovative ideas. At the same time, the PANACEA project will establish capacity building activities through substantial training courses and educational material with practice-oriented knowledge on specific value chains that will be easily accessible and available in the long term beyond the project period. Not only; the projects aims to develop, operate and maintain the PANACEA platform which will offer a range of services to key stakeholders and end-users on NFC, including: knowledge sharing, communication and networking, assessment of the economic and environmental aspects of NFC, and matching between the supply and demand sides. The last PANACEA’s aim is to disseminate the project findings at large scale, following an extended exploitation and dissemination plan that will be active throughout the project and beyond. In the meanwhile, the project will ensure the sustainability of the Thematic Network on non-food crops through its link with EU wide initiatives, especially the EIP-AGRI and its Operational Groups. The consortium of PANACEA is the strongest asset for making the objectives realistic and achievable during its lifetime. The consortium is divided in two main groups. The first group consists of Universities, research organisations, SMEs & industry. It has profound experience on NFC research that covers the whole production chain through the actual participation of its members in the most relevant research projects on NFC, such as COSMOS, EUROBIOREF, BIOCORE, 4FCROPS, Crops2Industry, Bioenergy Chains, S2BIOM, Biomass Futures, Biomass Policies, FIBRA, Biokenaf, JatroMed, Hempsys, Multihemp, Grow2Build, EUROPRUNNING, OPTIMA, WATBIO, etc. The second group consists of Farmers’ Unions and experienced partners on research extension to the farmers by engaging farmers with subcontracts. Their deep expertise is based on similar work they are doing in traditional agriculture as well as on their involvement in projects like Smart-AKIS, Valerie, RECAP, FERTINNOWA, CARTOFA, ECOBIOM, ReGIX, CIBIOM, PIVERT, SKIN, etc. As such, this group will be the key of success for the innovation to reach the practitioners in an easily understandable way and to make the practitioners an active part of the consortium. The second group has carried out similar work on other subjects of agriculture. These two groups of partners will closely collaborate in the 10 participating countries in order to design the penetration path for the establishment of NFC in EU agriculture and in other European countries. In facts, PANACEA activities will take place both at national level, in 10 Member States (France, Greece, Italy, Lithuania, Netherlands, Poland, Portugal, Romania, Spain and UK) as well as at a European wide level. Furthermore, the online PANACEA Platform will facilitate the dissemination of results and interaction between stakeholders from all over Europe. 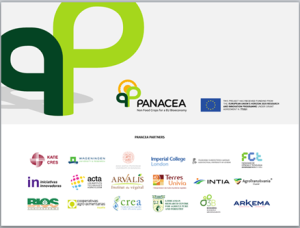 For achieving its goal, PANACEA follows a multi-actor approach, including in the partnership researchers, agrimarket players, farmers’ organisations and other practitioners from different EU countries. In this way applied research and innovation results on a variety of NFC will flow across geographical areas in EU and reach the practitioners. The work planned in the network follows interactive procedures, thus the applied knowledge and information already obtained by the practitioners is fed back to the researchers to enrich the relevant scientific research findings. It is recognised that the observed lack in market development for NFC is primarily the result of fragmented communication and slow exchange of science based evidence with day-to-day agricultural practices on the ground. Grassroots-level ideas, needs and success stories across EU will be analysed and extended to practitioners. Roadmaps mainstreaming NFC into European agriculture will be produced.